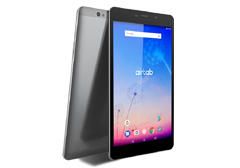 Description: Airtab is an 8-inch tablet running on Android 7.0 Nougat OS. Pictures come to life on its high-definition 1200x1920 display resolution. The Octa-core processor combined with generous 3GB RAM drives productivity and play to new levels. This powerful tablet boasts different connectivity from standard Bluetooth, dual-band Wi-Fi, and 4G LTE.